Hi, I am interested in your 1962 Lotus Seven-Replica (stock #0823-NSH) listed on Autotrader for $29,995. I'd like to get more information about this vehicle and confirm its availability. This Lotus Super Stalker is a street legal race car. Its a high-quality kit car that uses modern technology and updates in design to build on the original Lotus Super 7s formula for success of performance through light weight and simplicity. Its a blast to drive on the street, is a formidable contender in SCCA autocross competitions, and an awesome car on road courses. The look of this car stays true to the look of the original Super 7. Its a small, two-seat, open cockpit car. An aluminum grill leads the way with a splash of red, outlined with white, on the narrow hood that is painted with a smooth, black, truck bed lining finish. A functional hood scoop dominates the middle of the hood, and Super Stalker script appears on the side of it near the base of the windscreen. Separate front and rear fenders are also dressed in black, with another touch of red on the rear ones. Aluminum side panels keep with the minimalist theme and are removable for service access. The rear is dominated by the custom, removable roll cage, which is topped by a carbon fiber wing. The trailer hitch on the car may seem a bit out of place, but it is very useful for pulling a small trailer with race tires and some basic tools to the autocross or track events. Back to roots racing! The interior of this car is pretty basic, but trimmed out very nicely in red and black. The seats are finished in nappa leather and come equipped with Simpson 5-point racing harnesses. There is a padded arm rest on the tunnel just behind the shifter for comfort while driving, although it might be mostly for your passenger as your shifting arm will probably stay pretty busy while driving, especially on track. Ignition and basic switches are just above the shifter. Auto meter Pro-Comp ultra-lite gauges look great in the carbon look dash, and monitor engine functions reliably. There is padding on the kick panels and even a full carpet kit in this car. Finish the interior off with a removable steering wheel which makes it much easier to get in and out of the car, and also is a cool race car feature you wont find on many other street cars. The drivetrain on this car is what its all about. No expense was spared, with high quality parts used throughout. Please check out the build receipts and photos that come with this car for extensive added details. 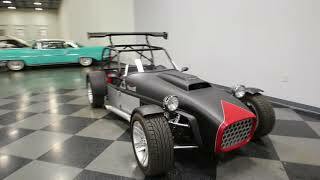 The engine powering this lightweight hot-rod is a 3.8 Liter GM V-6 with an Eaton supercharger. It starts up every time without hesitation and exhausts out those awesome side pipes that sound great. Power is sent back to a Borg Warner 5-speed transmission, and then to the solid axle rear end located by a multi-link suspension with coil over springs and shocks. The front suspension is control arms with coil overs and the steering is a rack and pinion system. A 10-gallon fuel cell in the trunk feeds the beast, and 4-wheel disc brakes with a Wilwood master cylinder kit provide great stopping power. 205/60R15s are mounted on MB Motoring alloy wheels at all four corners. Check out this car from Brunton Automotive that can compete with purpose-built exotics on the track, and handle the bumps of public roads during the week. Then take it home and start having fun with it.